Boys in our Books is so excited to welcome Astrid Amara to the blog in celebration of Queer Romance Month! 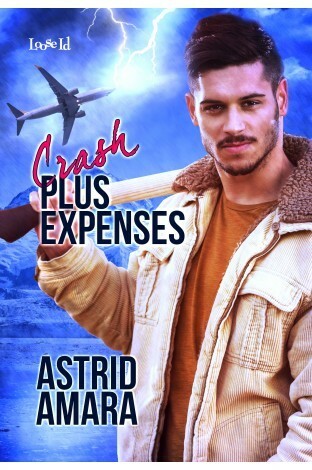 Here’s an author-read audioclip of an exceprt from her soon-to-be-released new book “Crash Plus Expenses”. Queer Romance Month runs throughout October, celebrating love stories in all shades of therainbow in all shades of romance. Join us, and over a hundred LGBTQ+ authors and allies, for essays, flash-fiction and much, much more. Dan Lewinski would follow his subject Connor Katz to the ends of the earth. It’s what he’s paid to do.Apparently this also includes following his subject Connor Katz as they plummet TO earth, because their plane is going down. And Dan likes living so that’s a problem.It’s also a problem because he knows there’s a secret behind Connor Katz’s past, a reason the man’s sister is paying beaucoup bucks to have him followed, a reason Connor appears so quiet on the outside, yet seems lit like a fire from within. Dan needs to know Connor’s secret.But IF they survive the crash, how on earth can Dan get to know the mysteries of a man he’s been in love with from afar without admitting he’s a private eye who’s watched his every move? Astrid Amara is the author of numerous contemporary, sci-fi/fantasy, and holiday romance novels all featuring gay protagonists. She lives in Bellingham, Washington with a husband, three dogs, three goats, and a horse. When she’s not writing she works for The Man or engages in her favorite hobbies: eating, sleeping, and sleeping longer. This entry was posted on October 12, 2015 by BioB in News and tagged astrid amara, audio excerpt, queer romance month.